Another striking feature of Ethiopia is the large number of lakes, almost all of them in the Rift. They include Ziway, Langano, Abijatta, Shalla, Awasa, Abaya, and Chamo, which are situated in their own local systems of ‘inland drainage’. These lakes were formed by the millennia of heavy rainfall that hit Africa during the same period the ‘Ice Age’ was affecting northern Europe. Although they are slowly evaporating – ‘small puddles compared to their shrinkage has exposed huge areas of alluvial soil that allow prosperous and productive, agriculture and created a rich productive, agriculture and created a rich environment for wildlife and birds. The northern most Lake is Lake Zeway on 160kms form Addis. Southwards from here three further lakes AbijattaShalla&Langano are clustered closely together followed by Lake Awassa; much further south Lalke Abaya and Chamo. Lake Langano has developed into an unsurpassed resort popular with weekend visitors form the capital. There are good camping facilities and excellent hotels and chalet bungalows situated along its bays, fronting sandy beaches perfect for swimming, sailing, water skiing and wind surfing. 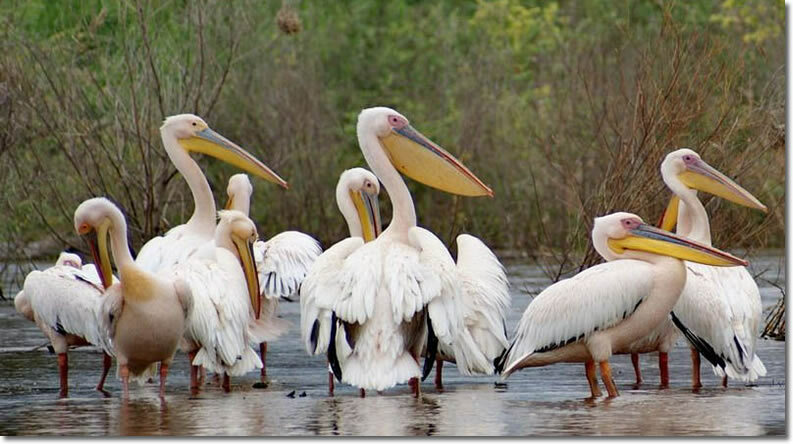 Lake Shalla the deepest lake of all lakes (260 meters deep) is the most important one for the breeding colony of the Great White Pelicans. Lake Abaya is the largest and longest in length (72km) provides well-stocked fishing grounds for these splendid birds and also excellent feeding place of Flamingos. Farming people populates the shores and islands of Abaya and Chamo. Lake Chamo forms one of Ethiopia’s finest National Parks-NechSar. In the reed fringed bays of Chamo’s sparkling aquamarine waters hundreds of hippos emerge at night to graze on the grass shores. Lake Chamo is a sanctuary for hippopotamus, several thousand crocodiles and fish species. Gazing on these lovely expanses of water body, one cannot help but speculate on the majesty that must once have been theirs when the great rains poured down over Africa.